This macro copies messages, appointments, or contacts stored in the Windows File System back into Outlook. The macro uses the .OpenSharedItem Method to select the messages and also can be used to import appointments (.msg or .ics) or Contacts (.msg or .vcf) into the Calendar or Contacts folder. 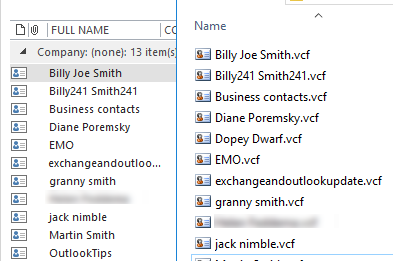 This macro gets the messages in the current folder and copies them into the Outlook folder identified as the Savefolder. It can either be hard-coded or use the current Outlook folder. Messages that cause an error are skipped. Keep in mind that if you run it on email messages and save to Contacts folder, you'll create contacts, replicating the action of moving a message to contacts. This macro works in Outlook 2007 and newer. You need to set a reference to the Microsoft Scripting Runtime in Tools, References. If the reference is not set, you'll receive a Compile error: User-defined type not defined. You can use an If statement to limit the macro to email, calendar, or contact items as necessary. Dian I notice you have many different version of inserting and making folders etc, but no one total piece of code. Can you point me to how I could import messages from a windows file system with multiple depth folders back into Outlook? Does a book exist that can help with this? I can't seem to get this to work with Outlook 2003 because Session.OpenSharedItem(FileItem.Path) didnt come out until 2007. Can this work with .eml files? I haven't tried, but it might since you can open eml using outlook. Thought I would follow up on this. It doesn't work, OpenSharedItem doesn't support .eml files. I have the same issue as Chris. I get a copy of the imported messages in the selected folder, and a copy in the default PST's "Inbox" folder. Does the macro have to be tweaked to avoid saving to the default PST's "Inbox" folder? Works great except I get two of each msg contacts. Any ideas? This code dont work with outllok 2013. Did you set a reference to the filescripting object in Tools, References? Look for Microsoft Scripting Runtime in the list and add a check in the box. If I change SourceFolder to hard drive (“c:\temp\”) it’s OK.
You're referring to it as "F:\" ? it's possible that scripting needs read/write access, which it won't typically have with a cd. I also got the run-time error '-2147024809 (80070057)'. I moved the files to SourceFolderName = "C:OutlookFiles"
Thanks for your replay. I have set the filescripting object in Tool and all is OK.
-It s possible to select Save Folder and Source Folder, in the same way that the project "Saving All Messages..." ? -it s possible to give tips for you, all your code are perfect ? You could select the folders, i should have some code samples on the web site that shows how to do it, both in outlook and in windows. BTW, You need to set a reference to the Microsoft Scripting Runtime in Tools, References. If the reference is not set, you’ll receive a Compile error: User-defined type not defined.